Add power to your daily oral care routine with the new Sunstar GUM ActiVital Sonic toothbrush – the sleekest sonic brush on the market. The advanced ergonomic handle and slender neck absorbs any excess pressure, for a gentle, but thorough brushing experience. -Scientifically proven superior efficacy. 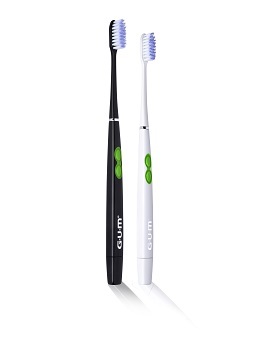 Its soft tapered bristles remove up to 50% more plaque between the teeth and reach deeper below the gumline. -Gentle vibration. Use it as you would use a manual brush while enjoying the extra vibrating power for a deep, yet gentle clean. -Design & functionality. Sleek and stylish, with a replaceable head and batteries – great for travel and use at home. Prefer black or white? You choose, the GUM ActiVital Sonic toothbrush comes in both. 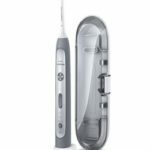 -With a battery and travel cap included, the Sunstar GUM ActiVital Sonic Toothbrush is ideal for holidays or home. It’s available in two colours – black and white – at a recommended retail price of R245 from Dis-Chem, selected dentists and pharmacies. -The replaceable AAA battery and replaceable head (recommended retail price R86 for a 2-pack) mean it lasts longer and is excellent value. -Travel cap and battery included – great for the gym and travel! For more product information contact distributor Ivohealth on 0860 456 123 / info@ivohealth.co.za or visit www.ivohealth.co.za.